So, MonsterUp Adventures was released more or less 1 month ago. People seem to love it so far! And we would love to release some download numbers for you guys. 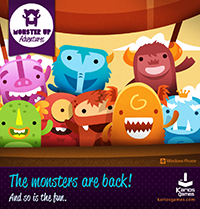 So, without further ado, I am in the pleasent position to announce that in this month, MonsterUp Adventure has been downloaded more than 7200 (update: it seems that my unofficial downloads were off – official downloads that are just coming in indicate that we are talking about more than 12,000 downloads in the first month!) times (and counting) and has been played more than 17000 times (update: logically, this must be more than 20,000 by now). We also have received more than 190 reviews from all over the world, with an average of almost 4.7/5 (94%) which left us speechless!